The Haynes Family of Programs provides specialized treatment and educational services to children with special needs relating to emotional development, autism, Asperger’s Disorder, learning disabilities, neglect and abandonment. At Haynes they focus on children and families that can face significant emotional, behavioral and mental health challenges. Part of this outreach is to provide a fun, physical activity environment for the students to relax, enjoy, and work up a sweat! Enter the Exergame Projection System. 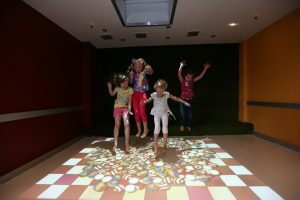 With the The Exergame Projection Surface you can turn any floor space into a multi-point interactive experience. This interactive surface, which can be as large as 18 feet wide, creates a fun, exciting, and engaging experience by tracking users shadows with highly accurate motion sensing technology. With a wide range of games, kids and adults can be entertained for hours while running and jumping around. Choose from nearly fifty exciting and engaging games that are sure to bring smiles to everyone who uses it along with an elevated heart rate! We look forward to hearing more about the Haynes Family Programs experience with Exergame and our Projection Systems. Contact us to learn more!